Scientists have hoped that ultra-high-energy neutrinos could point to sources of ultra-high-energy cosmic rays—supermassive black holes at the centers of galaxies or hypernova star explosions, for instance. 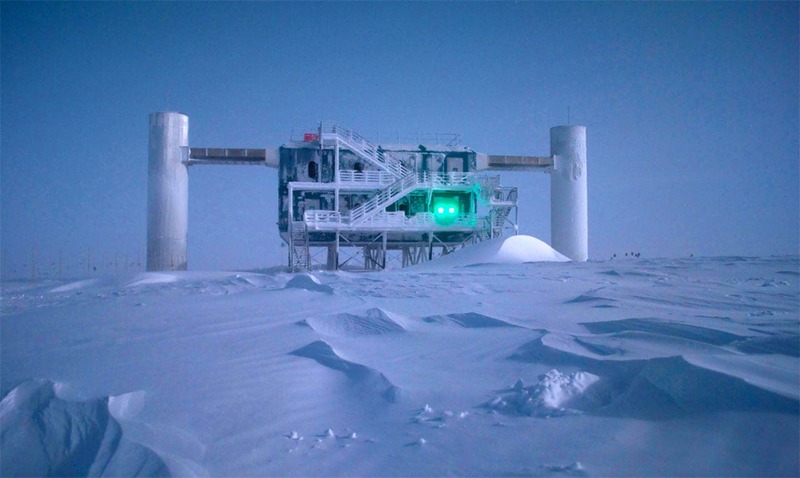 Now, evidence of a fourth ultra-high energy neutrino—the highest-energy neutrino yet—has been detected by the South Pole-based IceCube experiment, a project that Berkeley Lab researchers helped build and to which they currently contribute analysis. But this most-recent neutrino finding, says Berkeley Lab’s Spencer Klein, only “deepens the mystery” of cosmic ray origins. The event was found by researchers at Rheinisch-Westfälische Technische Hochschule Aachen University in Germany as part of a new search for astrophysical muon neutrinos. The researchers’ main analysis objective was to confirm previous IceCube measurements of other astrophysical neutrinos. The new ultra-high-energy neutrino was an unexpected bonus. The new neutrino was found thanks to a muon trail observed by an array of 5,160 optical detectors, using electronics designed and built by Berkeley Lab scientists and engineers. Muons are heavy relatives of electrons and are emitted when a type of neutrino called a muon neutrino interacts with an atomic nucleus. The recently detected muon had such a high energy—about 2600 trillion electronvolts—that it could have only been produced by an ultra-high-energy neutrino. The muon track was several kilometers long, too long for IceCube to have captured the entire trace. This means the actual neutrino energy was likely several times higher than was seen in the detector. Similar to the way that a muon can lead scientists to a neutrino, a neutrino can point to the origin of cosmic rays. Cosmic rays are charged particles that are suspected to come from ultra-high-energy sources outside the galaxy. But because they are charged particles, they arrive at Earth only after following follow chaotic, twisted paths circling around magnetic field lines in space. Ultra-high-energy neutrinos are believed to come from the same sources as cosmic rays, but differ in that they are neutral, and they therefore travel in straight lines. So, if you catch a neutrino streaking by, the thinking goes, just look in that direction and you can see a cosmic ray source. But in recent years, pointing instruments in space at neutrinos’ suspected sources hasn’t revealed obvious source candidates. Indeed, when instruments were aimed at the sky from where this newest neutrino came, no high-energy phenomena were found. Thus, some theorists have devised models that propose ultra-high-energy neutrinos are actually left over from the birth of the universe or that space might not be symmetric in the way physicists once thought. At the same time, recent analysis of previous IceCube data by Gary Binder, a Nuclear Science Division graduate student who works with Klein, suggests that the more conventional cosmic-ray sources such as supermassive black holes are still more likely. IceCube is an international collaboration of more than 300 scientists and engineers, from 50 institutions around the world. The University of Wisconsin, Madison, manages the detector with construction and operations funding from the National Science Foundation and international partners.